How Did Netflix's Star-Studded Friends from College Go So Wrong? With Friends like these, who needs Netflix? Winter, spring, summer or fall, please don’t call. I had a lot of fun putting new spins on old clichés while watching the new Netlix series Friends from College. I had to do something to distract myself from how bad the show is. The series stars a who’s who of the TV comedy world. How could a series featuring Cobie Smulders, Fred Savage, Keegan-Michael Key and Nat Faxon—with an occasional appearance by Billy Eichner—go so wrong? As the extremely literal title suggests (it’s akin to me deciding to name my first born “Child Number 1”), the eight-episode series follows six college friends approximately 20 years since they left Harvard. The series’ biggest misfire is that it hangs its degree on the adulterous affair between Ethan (Key) and Sam (Annie Parisse). (No spoiler alert needed, since the illicit romance is revealed before the opening credits of the pilot). The pair have been at it since college: “a stupid college hook-up that never ended.” The problem is, now they’re officially married to other people. Ethan to Lisa (Smulders), who was a freshman when she first joined the gang, and Sam to John (Greg Germann). Sam and John have two children and are super wealthy, with a luxurious country home and a tricked-out car. Sam wears a Valentino cape dress to a simple girls’ night out. And they order breakfast from a delivery service on the weekend instead of cracking an egg. Aspiring actress Marianne (Jae Suh Park) and rich, unemployed cad Nick (Nat Faxon) round out the group. “It’s not your fault you have a trust fund,” Lisa tells Nick. When Ethan and Lisa decide to move back to New York, Ethan and Sam resolve to end their relationship. Except they don’t. They go at it in the car, the vacation home, a hotel room, any chance they get. I think (?) we are supposed to feel sorry for them because they have some big passion, but instead they just come off as jerks. The show never explains why Ethan and Sam didn’t just date for real and marry each other in the first place. And it’s also pretty clear that their attraction is rooted in their inability to be together, which makes their relationship not only stupid but boring. The series also suffers from a wildly inconsistent tone. Kate McKinnon pops up in the third episode as a hugely successful young adult writer. I adore McKinnon, but her outrageous character here belongs in a five-minute Saturday Night Live skit, not in a series that seems to be going for some sense of verisimilitude. Likewise for Marianne’s gender-bending take on A Streetcar Named Desire and Lisa’s misogynistic co-workers (even if one is played by Ike Barinholtz). Eichner leaves the outrageous characters he’s known for behind to play Felix, Max’s (Savage) boyfriend. For the most part, Felix is the straight man (no pun intended) to all of the friends’ antics. Like us, he finds their behavior preposterous, but every so often the Eichner we know and love sneaks through, which makes Felix a perplexing and uneven character. So much of the show is perplexing. Why are Ethan and Lisa living on Marianne’s couch? If she’s a successful lawyer, they should at least be able to find a temporary place to live. Why is Lisa still smoking and drinking in the midst of her IVF treatment (I’m fairly certain that’s a big no-no). Why does Marianne agree to keep Sam and Ethan’s secret? How can she even look Lisa in the face? Felix is a fertility specialist who treats Lisa and Ethan now that they’ve decided they’re ready to have children. Because who better to see for your most intimate medical needs than the boyfriend of your best friend from college. They’re in New York, for heaven’s sake. Find another doctor! Infertility and what some women have to go through to conceive a child is a story line that Friends From Collegeis ill-equipped to take on. This is confirmed when Ethan and Lisa spend an entire episode trying to get the fertility drug Lisa needs after Ethan drops and breaks the vile. These people went to Harvard and they don’t know how to contact the on-call doctor? Plus, it’s hard to watch Ethan be sweet to Lisa when we know he’s cheating on her. The series is a mix of a poor viewer’s The Big Chill and St. Elmo’s Fire with a dash of Friends thrown in. Friends from College is one of those shows where characters speak in quippy one liners instead of actual conversations. “Every one of your fixes creates a new problem. You’re like a contractor,” Sam tells Ethan. In the first four episodes, characters get arrested for public fornication, destroy public property and kill a pet. The rub is, these characters are awful—but none of them think they are. I want to say something positive about a series that sports this level of talent, both on screen and off (it’s created by Nicholas Stoller of Forgetting Sarah Marshall), so I will admit to loving the opening credits, which is a montage of how the meals the gang has shared over the years have changed. I also appreciated all the throwback pop-culture reference. Felix and Max binge watch Damages. Max and Ethan wrote Monica Lewinsky: The Musical in college. And Max, Ethan and Nick have to “Beautiful Mind” something to figure it out. Also, the gag about pretentious New York restaurants was pretty funny. And, well, that’s about it. You will not want to be there for these Friends. 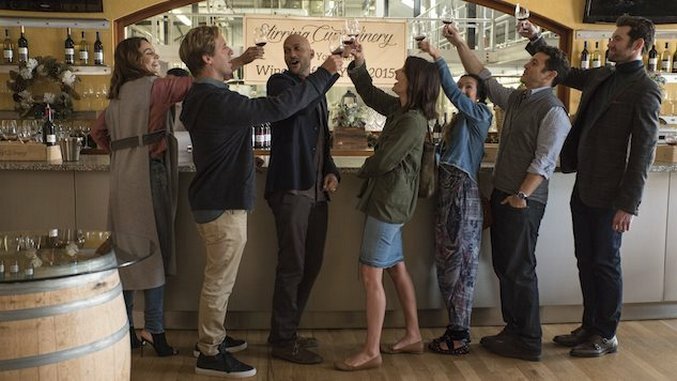 Friends From College is now available on Netflix.